They will be sure to brighten the tree up. They can also be used to make a garland by threading a piece of string through the baubles and hanging up in the window or on the wall. 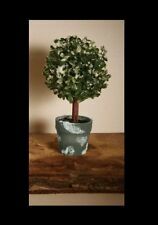 Great for larger trees. Luxury handmade set of 6 pieces Cotton Balls Christmas Tree Decoration. It's a unique X-mas baubles set. Set quantity: 6 balls. I'll do my best to satisfy you. Warm Tip Simple and easy. In glitter, matte and shiny designs, these black baubles will look beautiful hanging from your Christmas tree. Thread not included. Also great for schools, colleges and workplaces. Topiary ball tree in a frosted pot. For indoor use only. CLEAR OPAQUE LIQUID GOLD TRELLIS STRIPE GLASS BAUBLE DECORATION BY GISELA GRAHAM LIMITED. DURING THE BUSY PERIOD BEFORE CHRISTMAS. YOU ARE BUYING ONE SET OF TWO DECORATIONS IN THE DESIGN SHOWN. 25cm H x 25cm W Size. 25cm H x 25cm W x 25cm D. Matt finish. A very versatile product, suitable for multiple display purposes, such as tree decoration, window displays and table centrepieces. BEST QUALITY PRODUCTS. 1 x Fair Trade Bauble - Hand Painted in India. 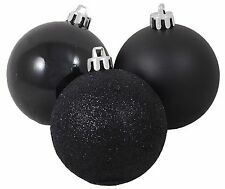 In glitter, matte and shiny designs, these black baubles will look beautiful hanging from your Christmas tree. Thread not included. You will receive 10 baubles picked at random. Bauble Is a Transparent Ball with and The Image Is Taken with Socks Inside the Bauble. Harry Potter Christmas Bauble with Socks Xmas Tree Decoration. In glitter, matte and shiny designs, these orange baubles will look beautiful hanging from your Christmas tree. Thread not included. You will receive 10 baubles picked at random. 4 x Black & Amber Nkuku Danoa Baubles. The mix of round and teardrop shapes sit perfectly on a tree. Set of 4 - 9 x 6cm (dia). Handknitted tinsel bauble with matching double sided satin 3mm ribbon. 3 have gold ribbon, 2 have black ribbon. Use this glittery yarn for accessories such as scarves, christmas wreaths, christmas tree decorations, a party wrap and much much more. Handknitted tinsel bauble with matching double sided satin 3mm ribbon. Use this glittery yarn for accessories such as scarves, christmas wreaths, christmas tree decorations, a party wrap and much much more. 1 Bauble Hand Painted in India. This unique and gorgeous decoration is handmade in Kerala from varnished papier mache. The Keralans use rice paper which is stronger than regular paper, making these decorations stronger than paper maché made in other parts of India. These giant size baubles are great for larger trees. They would even be great for making a garland. Simply thread the baubles through a piece of string. You will get 5 baubles which will be a mixture of shiny, matt and glitter. If you have any other query feel free to write to us. We are always happy to do our best to resolve any issue. Other Styles Also Available! 1 x Hand Painted Bauble. Product Type Baubles. This may not be suitable as a gift. BEST QUALITY PRODUCTS. Best Products at Affordable Prices. Scottish Highlands, Scottish Isles, Northern Ireland, Isle of Man and Isle of Wright. 10cm H x 10cm W x 10cm D. Harlequin beaded ball decoration, bead /sequin trim. Complete with hanger. A stunning beauble which will really set your tree off this Christmas. Detailed and eye catching, dot in odd numbers on your tree, for a super look. These giant size baubles are great for larger trees. They would even be great for making a garland. Simply thread the baubles through a piece of string. You will get 50 baubles which will be a mixture of shiny, matt and glitter. BLACK GLASS BAUBLE. A lovely hand decorated glass bauble, that would look stunning on a Christmas Tree or as part of a table decoration. Colour & Design - Shiny Black with Silver Glitter Diamond Pattern and little Green Gem. SHINY SILVER GLASS BAUBLE. A lovely hand decorated glass bauble, that would look stunning on a Christmas Tree or as part of a table decoration. Colour & Design - Shiny Silver with Black Glitter Triangle. Essi guardare splendida in qualsiasi albero di Natale. Abbiamo un sacco di altri colori disponibili connessione internet a qualsiasi tema del colore. Include stringa di argento per di legare attraverso il cerchio e appendere sul vostro albero.